Providing accessible information is vital in engaging with your constituents who have a learning disability. 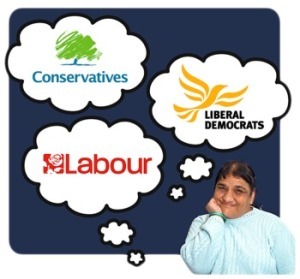 Time after time, people with learning disabilities tell us that the lack of accessible information is the biggest barrier to their ability to get involved in many aspects of life – and that includes politics and voting. Accessible information is also good for engaging with others; ‘easy read’, for example, is equally useful for communicating with people with lower levels of literacy or who do not have English as a first language. Indeed, in our time-poor society, many people – from every background – find that simple, easy read information makes it far easier to understand and digest issues; particularly complex issues around politics. This guide has been created to help you provide accessible information to support the needs of all your constituents, and to signpost you to other support and resources that are available. Creating accessible information isn’t difficult but there are a few important points to consider. We have separated out this section to take you through the various steps of layout, pictures, words and the use of other formats. We have also included some information about accessible websites. Try to make a page look inviting and clear – uncluttered. Keep pictures and photos to the left, text to the right. Make sure the text is neatly lined up with the image. If you are doing a flyer-type document, keep the picture above and the text below – rule of thumb is: Pictures first. Make sure there is space between points you are making. Do not put text over images as it can be difficult to make out and read. Many people with learning disabilities say that the most important thing about communication on paper is to use pictures. Using pictures with brief text means people can use the picture to make sense of the text. Pictures need to be relevant to the text so choose them carefully. We get to choose our government by voting for the people we want to become MPs and work for us in Parliament. This is called democracy. Using pictures can mean drawings, symbols or photographs. If you can, use either photos or drawings, rather than a mix, but don’t worry if you have to mix these to convey a message clearly. Make sure pictures and photos are appropriate for the audience, i.e. no childish pictures for adults. Make sure the images and relevant text are lined up neatly to avoid confusion. A political party is a group of people who join together because they have similar ideas about things. Make sure that pictures are consistent. If talking about ‘work’, use the same picture every time you mention it. Make sure the document is fit for purpose, e.g. clear enough to be photocopied, good enough quality to be printed. Coloured pictures or photos are more interesting but can be difficult to photocopy. There are lots of resources available that have great pictures and photos for you to use, such as Photosymbols and Change picture bank. These resources use people from a variety of backgrounds as models. Talk to the reader — use ‘you’. Use clear, easy words. Simple, short sentences are best. If you have to use a longer sentence, you can pull words out to make things clearer for people. Avoid big words, jargon or abbreviations. If you need to use unfamiliar words, explain them afterwards. AVOID USING ALL CAPITALS, which are harder to read. If you need to emphasise a word, use bold or make it larger, without overdoing it. Good fonts to use are sans serif or Helvetica-based fonts such as Arial. Do not use fancy fonts as they can be hard to read. You can include a glossary with your information to explain any ‘jargon’ words. Make sure your use of words is consistent through the document. If you talk about a ‘job’, do not call it ’employment’ in the same document. Print at least font size 12 and if possible much larger. Most people with learning disabilities would prefer a font size of 14–16 pts. Use left alignment — justified text is too hard to read. Try and keep to one idea per sentence. If it is a long document, put in a summary at the beginning, saying what it is about. Use bullet points to break up the information. Always start and end a sentence on the same page. Try to break up information using headings. Give each new point its own paragraph. It is estimated that over 60% of people with learning disabilities also have a hearing impairment, and many more are blind or visually impaired. Offer your information in other formats. Often it’s cheaper to produce more than one thing at the same time; you might want to put more than one document on an audio tape or CD, for example. Use contrasting colours in font and background. Black or a dark colour like blue or purple on pale yellow is easier to read than black on white. Video is an easy way to communicate with people. A high number of people with learning disabilities have a hearing impairment and many use British Sign Language (BSL) or speech-supported signing like Makaton or Signalong, so consider videos with captions, subtitles or speech-supported signing. Make it easy for people to know what a button does: use easy words like ‘send form’. 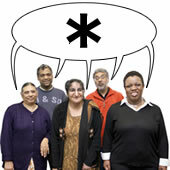 The most effective way to get ideas that work is to consult people with learning disabilities. There are many self-advocates and self-advocacy groups: people with a learning disability who speak up for, and represent, themselves. You could visit them, or invite them to visit you for a consultation session. They often have a great deal of experience of working with individuals and organisations, including working with others to make things more accessible. There are also experienced people who act as trainers and consultants. As with any consultation, try and get a cross section of people involved. If possible do this before you start a new document or when you are revising an existing document. Different people with learning disabilities have different communication and usability needs. For example, consult people who are also visually and/or hearing impaired. Make sure people you employ are also fully aware of disability issues. It is a legal requirement for service providers to make “reasonable adjustments” to accommodate the needs of people with a learning disability, so it is important to find out what these needs are. There are plenty of organisations and groups of people who provide advice and support with disability awareness training. There is also a great deal of information already available on the internet and in other formats. There is no need to reinvent the wheel! Using this website as a starting point, you can link in to all sorts of help and ideas. Tell people what steps you are making. Tell people on your website that things are available in other formats and make it easy for them to ask for things. Make it clear in your publications that people can ask for things in another format — even if you still need to produce it as they request it. The law requires service providers to make “reasonable adjustments” to meet the needs of people with disabilities and that includes people with learning disabilities. We know that it can be scary to bring about change but there are lots of resources to help you. Don’t be afraid to make mistakes — ask for help. Remember, things do not have to be perfect. Make some small changes to the way you do things and share the results – we’d love to hear from you! 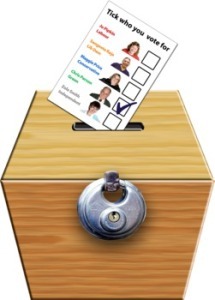 Email everyvotecounts@unitedresponse.org.uk or tweet @unitedresponse using the hashtag #EVC.